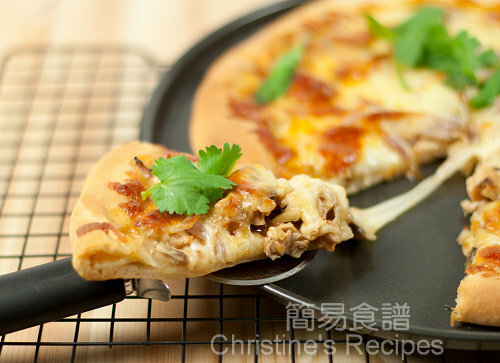 Pizzas are one of the popular snacks in a party, especially those are straight from the oven. I’m not throwing any parties at home anyway. This is the post for joining an online pizza-pie party, that follows our first gnocchi party. It’s been a while that my family hasn’t eaten any pizzas. So it’s a good incentive to get myself motivated and bake some pizzas again. After a few email exchanges, the crews of our online party finally decided to name it as “International Pizza-pie Incident”. It’s so much fun that all the participants post their own recipes on the same day, as well as feel surprised to find out what kinds of pizzas others would have made. For this pizza-pie incident falls on the same day of Penny’s birthday. Penny has put a lot of efforts and time to organize our party. I’d like to take this opportunity to say thank-you and wish her a “Happy Birthday”. I made two different pizzas actually. 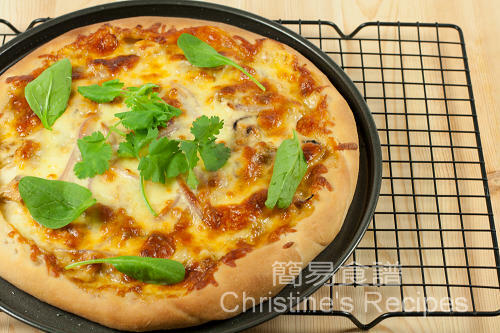 The first one is our family’s favourite, BBQ chicken pizza, with thin and crispy base. To make the pizza special for celebrating Penny’s birthday, I stuffed extra Mozzarella cheese in the edge, adding richer cheese flavour, with a curl up edge that makes more rooms in the middle for more toppings. If any of our crews’ birthday in April that I don’t know before, this pizza is made for you as well. The pizza dough is big enough for making two 10 inches pizzas. Apart from making a barbeque chicken pizza with cheese stuffed crust, I also baked a spicy Hawaiian pizza with homemade sauce. Considering this post is quite lengthy, I’d post another recipe in the next post. Add sugar into 3/4 cup warm water and mix until dissolved. Sprinkle yeast over it and let sit for 5 to 10 minutes, until it foams and bubbles. I used a bread maker to mix all ingredients until dough is foam. If you knead the dough by hands, sieve the flour, milk powder and salt onto a clean surface. Make a well in the middle. Pour yeast mixture and oil into the well. Start from the middle to mix the flour into the liquid. Knead with clean hands until you get a smooth and springy dough. Season chicken breast with salt on both sides. Place in a bowl, then coat chicken with 3 tablespoons of BBQ sauce, and marinate for about 30 minutes. Heat oil in a frying pan, cook chicken breast over medium heat, until cooked through. Let cool and cut into small cubes. Coat with 2 tablespoons BBQ sauce. Preheat oven to 200C (395F). Remove the dough from fridge (if you use method A, in step 3 above). If you use method B, the dough is ready to be used when it’s doubled in size. Roll the dough out into a round disc, about 0.5cm in thickness. Place them on a slightly larger pizza pan (sheet pan), drizzled with olive oil. Place Mozzarella cheese sticks around the edge. Along the inner side of cheese sticks, damp the dough with some water, fold the outer edge inside as picture shown. 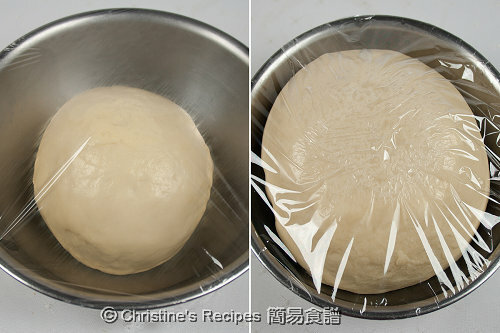 (Note: be sure not to let any oil touch the surface of dough at this stage, the edge can't be sealed easily otherwise.) Prick the surface of dough with a fork. Drizzle a bit of olive oil on the dough surface and spread evenly to avoid your dough from being soggy. Spoon a couple of tablespoons of extra BBQ sauce on the dough and spread it evenly. Sprinkle on 1/3 of cheese, then diced chicken, red onion, mushrooms. Sprinkle the rest of cheese on top. 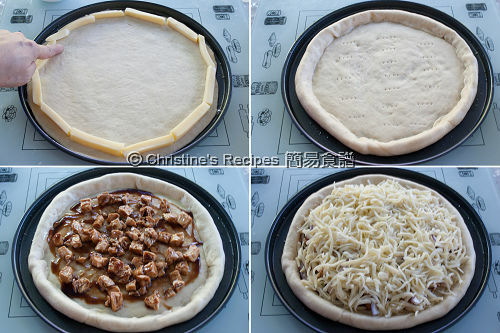 Bake in preheated oven for about 15 minutes, or until the base is golden brown, cheese melts, and toppings are bubbly. Remove from the oven and sprinkle as many baby spinach or coriander as you like. Cut into wedges and serve hot immediately. I tested two batches of pizza dough, that made with exactly the same ingredients and methods, except using different fermentation methods. For the batch of fermented dough in a warm spot after 1 hour, the base turned out very soft and spongy after baking. For the other batch that fermented in fridge over 1 day, it’s much easier to stretch thin and didn’t shrink back easily when I tried to roll out and stretch it. The base turned out to be a very crispy crust. I love both ways. Just pick either way which you like or seems convenient to you. You can use plain flour(all-purpose flour). If you like soft texture, highly recommend bread flour or Italian Tipo '00' flour. Try to roll out the base as thin as you can, then bake in oven for longer time to get crispy base if you like. Gluten-free flour can be used instead if you like. Gluten-free flour can be used instead if you like without doubt. This reminds me of a deep dish BBQ pizza from CPK which was my absolute favourite in the Philippines. Sadly there is no CPK in Sydney so I have missed out on this over the years. Yours looks like a worthy substitute! Sounds terrific - I love the cheese stuffed crust, yum! Awesome! I am glad that this is your personal family favourite and you are sharing it with everyone. Ooh you did a stuffed crust too! I'm known to leave some crusts left on my plate when eating pizza, but I think I'd be eating every bit of my crust if I ate some of this :) I love the stretchy cheese shot, it looks so tempting. Delicious pizza! The cheese stuffed crust looks delicious! Yum Christine! As always, your dough looks fantastic! I love bbq chicken pizza! Mmm....beautiful pizza. Love the cheese hidden in the rim. My heart really loves the addition of cheese in the crust. This looks like a really tasty pizza. I like this! I made something similar with smoked BBQ sauce and we love it to bit!! Will try your version in our next pizza experiment. This IS a great pizza! Your version is a keeper! Gotta love that stuffed crust! As much as I love tomato sauced pizzas, the BBQ sauce in this gives it that something extra special. Love pizza. Never attempted it at home though.. would definitely try out one day. A wonderful flavour for a pizza! I made chicken pizza last week but mine without the cheesy crust! Yum! I love the idea of extra cheese in the crust! Extra cheese ? That is awesome! Am loving this! I shall definitely have to try it the next time we do Pizza. Mouthwatering! Love the idea of a BBQ! Wow...love chicken pizza and with cheese in the crust...yumm! Your pizza looks scrumptious!! I made a BBQ chicken-yeast based meal, too. i love that you made your pizza a stuffed crust one. I've yet to try that out. Great process photos! Oh check out all that cheese. YUMMM. I like the cheesy crust. Now I'm craving for some pizza. Oh my gosh! That stringy cheese in the last pic is making me drool. I'm also impressed by how perfectly round your pizza is! Cheesy goodness. Oh that shredded Mozzarella cheese. Guess we are having pizza for dinner tonight. I've never made pizza dough before and have a question... I normally don't eat very salty and I'm afraid 1 tsp of salt would be too much. Should I divide it in half? Or is it safe to stick to the recipe? I've never worked with yeast before either. 1 teaspoon of salt for making 2 pizzas of 10 inches in size. It's not salty at all. I suggest you to keep following the instructions first. If you still find it too salty for yourself, you can adjust it then.